Omnitech has been collaborating with Rotary Australia for almost 2 years. We supply Rotary with playgrounds so that they can be transported all over the world to enable kids to play! Over the years we have enabled the removal of several playgrounds, and we enjoy seeing what part of the world they end up at. At Omnitech we believe it’s important to give back to the community. We love that our playgrounds can be used in less fortunate parts of the world so that all children can have access to play! All children deserve the right to play. Kids play impacts their growth physically, mentally and socially. The positive impact it can have should not be ignored, and it doesn’t matter where you come from: all children should have access to play equipment. 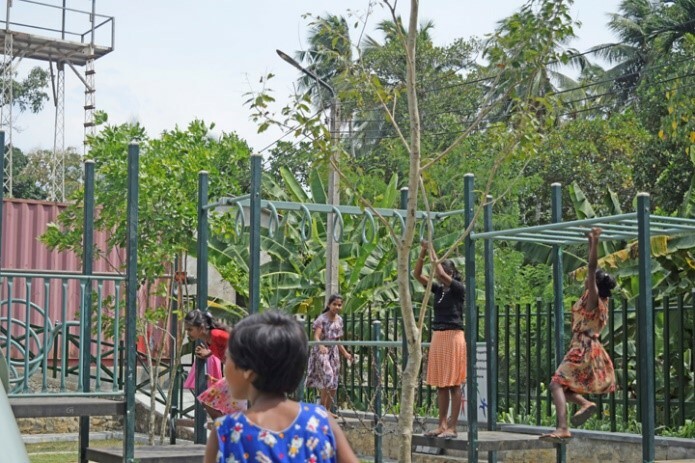 In one of our recent projects with Rotary, an Omnitech playground was sent over to Sri Lanka where it was then installed by Rotary in an international school located a few hours out of the country’s capital, Columbo. The photos show the children from the school embracing their new playground. From what we have heard they are absolutely loving it. It’s great to see the kids loving their new play space; it’s bound to keep them entertained for hours! The playground previously belonged in Leopold, Geelong, and the Greater Geelong Council aided in the process. We love our work with Rotary Australia as it means that playgrounds can continue to be used instead of ending up in landfills. We are looking forward to seeing which area of the world our other playgrounds end up.